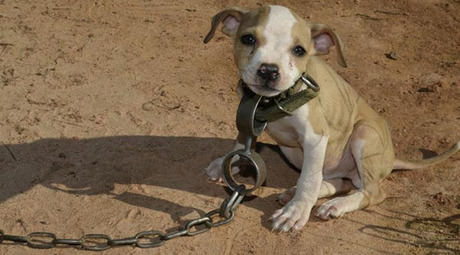 In August 2013, DogTime reported on a multi-state dogfighting ring that was raided by federal and local authorities, the ASPCA, and the HSUS after a three-year investigation. As a result of the raid, law-enforcement officers discovered dog-fighting and training equipment, narcotics, illegal firearms, and more than half a million dollars in cash. But more important, approximately 367 dogs — most of them Pit Bull Terriers — were recovered from the four-state operation. On Wednesday, eight of the people who played key roles in the dog-fighting operation, and related illegal activities, were sentenced. According to the ASPCA, U.S. District Judge Keith Watkins repeated how federal sentencing guidelines for dog fighting are far from adequate in proportion to the horrible nature of the crime. Watkins estimated as many as 640 dogs sustained injuries or died as a result of the illegal operation. “These dogs lived in deplorable conditions, were emaciated, had parasites, ear infections, eye infections, heartworms, fleas, and ticks,” U.S. Attorney George L. Beck, Jr. says. “Their living conditions constituted extraordinary cruelty. These dogs were also made to fight and, if they lost the fight, they were killed. Demontt Allen, 38 (Houston, Texas): Sentenced to 5 years in prison. Donnie Anderson, 50 (Auburn, Alabama): Sentenced to 8 years in prison. Sandy Brown, 48 (Brownsville, Alabama): Sentenced to six months in prison. Edward Duckworth, 39 (Decatur, Georgia): Sentenced to 14 months in prison and two years of supervised release. William Antone Edwards, 43, (Brantley, Alabama): Sentenced to 1 year and 1 day in prison. Irkis Forrest, 33 (Theodore, Alabama): Sentenced to 3 years in prison. Michael Martin, 56 (Auburn, Alabama): Sentenced to 5 years in prison. Jennifer McDonald, 36 (Collins, Mississippi): Sentenced to two months in prison. Anderson’s 8-year sentence is the longest ever handed down in a federal dog-fighting case. Following each sentence, each of the eight defendants will serve a 3-year term of supervised release; during this time, it will be illegal for any of them to own a dog.